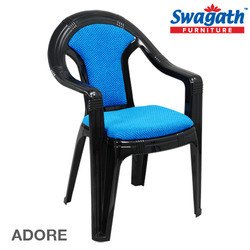 Providing you the best range of plush red cushioned plastic chair, cushioned plastic chair, plush blue cushioned plastic chair, plush brown cushioned plastic chair, plush green cushioned plastic chair and adore blue cushioned stackable plastic chair with effective & timely delivery. PLUSH chair adds elegance and comfort to your life. Excellence moulded for years of comfort. Like its name, Adore carries with it a design that has traditionally been used throughout the times. The addition to this evergreen design is the pre-provided cushion, along with strengthened polypropylene. 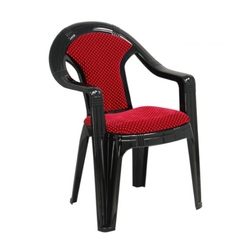 PLUSH is a heavy duty high back Cushioned Plastic Chair with arms. This luxurious plastic chair has a high gloss lacquer finish with a comfortable cushioned seat and back with premium fabric upholstery. 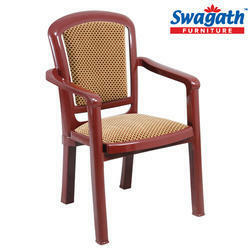 Swagath furniture recommends this chair for use in offices, homes, restaurants, and libraries. You can use this chair for many hours of comfortable seating. 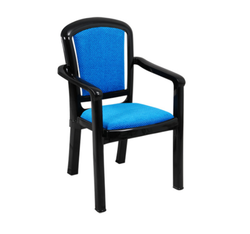 PLUSH is a heavy duty high back Cushioned Plastic Chair with arms. 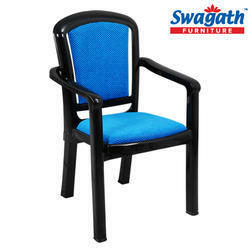 Swagath furniture recommends this chair for use in offices, homes, restaurants and libraries. You can use this chair for many hours of comfortable seating. This luxurious plastic chair has a high gloss lacquer finish with a comfortable cushioned seat and back with premium fabric upholstery. PLUSH is a heavy duty high back Cushioned Plastic Chair with arms. This luxurious plastic chair has a high gloss lacquer finish with a comfortable cushioned seat and back with premium fabric upholstery. 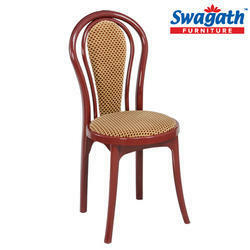 Swagath furniture recommends this chair for use in offices, homes, restaurants, and libraries. 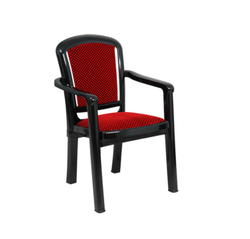 ADORE is a high gloss lacquered plastic chair with cushioned seat and cushioned back. This premium monoblock stackable cushioned chair offers great comfort. Adore is a stackable Plastic Arm Chair available in high gloss lacquer finish in a variety of colors with different cushion color options. Appealing fabric covers for the cushioned seat and cushioned back enriches the chair and gives an extra comfort. Suitable for indoor use. We are leading supplier of Plush Blue Chair. It derives its name from the colloquial English description of a comfortable seating arrangement. The finest polypropylene goes into the making of this cushioned chair, making it sturdy as ever. We are leading supplier of Plush Maroon Chair. The finest polypropylene goes into the making of this cushioned chair, making it sturdy as ever. Armless high back designer Plastic Chair in high gloss lacquer finish in a variety of colours with different cushion colour options. Appealing fabric covers for the cushioned seat and cushioned back enriches the chair and gives an extra comfort. Suitable for indoor use. We are leading supplier of Plush Red Chair. It derives its name from the colloquial English description of a comfortable seating arrangement. The finest polypropylene goes into the making of this cushioned chair, making it sturdy as ever. 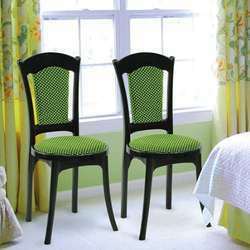 We are leading supplier of Plush Green Chair. The finest polypropylene goes into the making of this cushioned chair, making it sturdy as ever. We are leading supplier of Beauty Super Deluxe Maroon Chair. Armless high back designer Plastic Chair in high gloss lacquer finish in a variety of colors with different cushion color options. Appealing fabric covers for the cushioned seat and cushioned back enriches the chair and gives an extra comfort. Suitable for indoor use.